Have you recently been promoted, honored or published? Have you switched employers or career paths? Share the news with fellow Detroit Mercy alumni, parents, friends, faculty and staff. We will be updating this page soon. Look for the most recent listings in Spiritus, coming to your mailbox in early May. 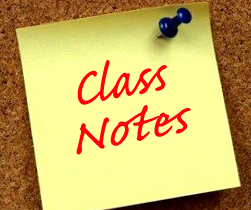 Send your Class Notes to alumni@udmercy.edu.